Last week’s massive network outage must’ve given mobile phone provider O2 a colossal headache. When something like that happens, it’s a perfect test of how well the company concerned has understood the social media environment. If they’ve “got” it, then the informal nature of a platform like Twitter will be a huge asset in humanising the company and getting customers back on side. If they haven’t, they’ll run for the hills and either resort to total silence or stilted corporate platitudes. Yeah. That’s about as running for the hills as you can get. As far as I’m aware, not one single person who Tweeted them on the issue ever received a response. 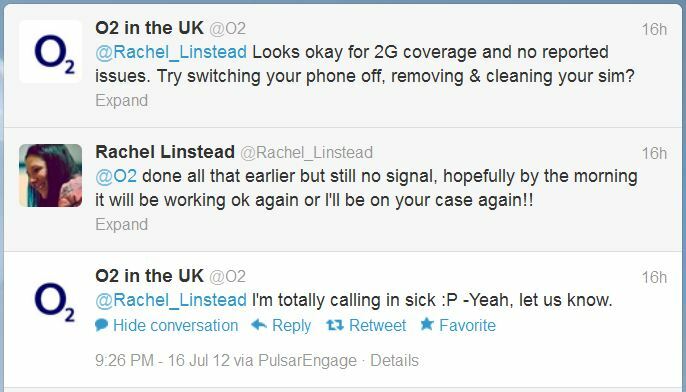 In a world where we’re constantly bombarded with corporate blandspeak, it doesn’t take that much to stand out; If I was one of those customers, I think the surprise of receiving a genuine, humorous reply would probably have bonded me to O2 for life. However you feel about swearing, for a large part of the population it’s part of everyday life and the normal way to express anger. Just because railway companies get away with putting up those signs designating pretty much anything they don’t want to hear as “abuse of their staff”, doesn’t mean you can make the rules on Twitter. A prissy reply telling the customer off for using bad words is rarely going to be constructive. Humour is one of those things that sets us apart from the animals – and from robots. Forget everything you’ve learned about appropriate corporate communications, and let the customer see that you’re a real person dealing with the issues as best you can. If the customer is complaining about obvious incompetence or failure, acknowledge that. For one thing, they’ll be so surprised that you’ll have a great opportunity to fix things while they’re catching their breath! Of course, all of this will be of very limited value if you’ve left someone manning your corporate Twitter account in a sealed room, with no support from the rest of the organisation. The tips above will go a long way to making the angry customer > customer service interaction a constructive one, but if the lines of communication aren’t there to back it up, you’re going to run into trouble. Make sure that whoever is running your social media presence has their finger on the pulse and a clear path of escalation to senior management if they need it. Then hopefully, you’ll never have to resort to the Twitter Witness Statement like Argyll & Bute.